Kathy Dawson Books, 9780803736931, 240pp. It's the start of a new school year and Wren Jo Byrd is worried that everyone will find out her parents separated over the summer. No one knows the truth, not even her best friend, Amber. When even her new teacher refers to her mom as Mrs. Byrd, Wren decides to keep their divorce a total secret. But something else changed over the summer: A new girl named Marianna moved to town and wants to be Amber's next bff. And because of her fib, Wren can't do anything about it. From take-out dinners with Mom to the tiny room she gets at Dad's new place, nothing is the same for Wren anymore. But while Marianna makes everything harder at first, Wren soon learns that Marianna once had to ask many of the same questions—the big ones, as well as the little ones—that Wren is asking now. Set in Wisconsin, with wonderfully nuanced characters—from the bossy new girl, who acts big but has a secret of her own, to the sporty girl who acts little and shy but who becomes an unexpected friend—this is a book about much more than divorce. 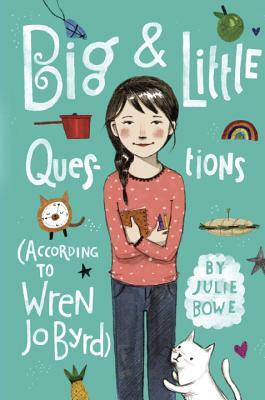 Julie Bowe is a full-time author who knows how to strum a guitar, count to three in Danish (en, to, tre! ), and had her first story published in fifth grade when she entered a contest in the local newspaper and won first place! Julie is the author of the Friends for Keeps series and lives in Wisconsin.